Eilbroun managed to get realllllly discounted tickets to one of the local comedy clubs, so he and Carmen, JB and myself went to see Sebastian Manascalco last Friday night. He had two openers, Chris Guilla (sp?) and Rob Martinez, both of whom were pretty funny as well. The show started at 8pm, and we got there just after 7pm, which worked out well. 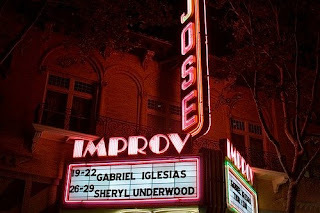 The San Jose Improv club is down near San Jose State University and Downtown. We paid $5 to park across the street, which wasn't bad since otherwise we'd have to find a garage and all that jazz. No photos were allowed, so I am just going to include some stock pics I found online. We picked up two more hurricane glasses there, as there's a 2-item minimum per person, and ordering a special take-home glass satisfies that requirement. The drinks were pretty weak, but at least they were original. We shared some appetizers at the table, none of which I'd brag about, recommend, or order again. We got the nachos (beans on the side) which were disappointing. The cheese was really runny and there were more jalapenos on there than tomatoes and onions combined. We got the chicken tenders, which were more like chicken fingers (short, thin, little coating), and horribly overpriced when you receive 5 of them for $9. Then there was the calamari. Not that much, and it was really rubbery. Plus the cocktail sauce wasn't that good and there was no tartar option. At least there was plenty of lemon. Lesson learned: eat before you go. We had fabulous seats, the table at the far right of this image, on it's own little ledge. Sebastian's jokes spanned the gamut, so that was good. He had a good bit on the Japanese (his Thai bit was a little frustrating), and their quiet and proper demeanor. There was a Michael Phelps bit (calling him a dolphin, hehe), followed by an Italian bit. My two favorites were the one about having company over and the one about dogs. The first started out describing how a "knock at the door" was once greeted with a whole family and a cake and excitement, and now it's more of a "get down! who invited someone over?" thing. The latter had multiple segments, and they're too long to really describe, but funny all the same. He did have a joke about Ross's department stores, but I had seen that one online (previewing his work ahead of time) so I didn't laugh as hard as I did the first time. 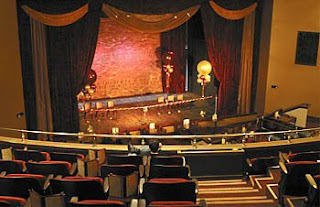 As we were leaving the place, we were given free tickets for a show next month: Mitch Fatel. 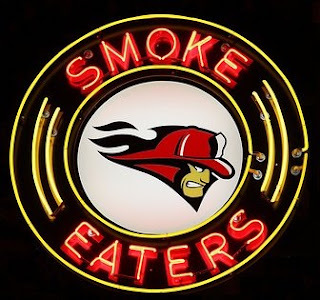 After the show we were hungry, so Eilbroun took us to a place he likes (he went to SJSU for undergrad, so he knows the area a bit), Smoke Eaters Hot Wings. I was pretty impressed with the place for its sandwich... not so much for its wings. But, that's just me. They only have the "hot" flavors, and I really prefer the more creative flavors, like honey bbq, mustard chipotle, cherriyaki, etc. They have seven levels of heat, and the three of them got level 4: Nuclear. Yeah, I thought that sounded fierce too, but the scale goes: mild, traditional, atomic, nuclear, traditional death, 4 alarm, inferno... so go figure. They were also like 80 cents per wing, which is ridiculous. I had the Gilroy Garlic chicken sandwich, which was a steal at $5. It's a chicken breast in a very original coating, fried golden brown, then covered in a monterrey-jack-type-cheese and a garlic spread. On a soft bun. Excellent. We also got some fries and a coke, but I wouldn't get the fries again, they were very bland and boring, even with ketchup. I might do the cheese curly fries though, they sound much better.